Asian wedding is one of the most complicated themes to prepare because the resources are not always readily available from the general market. 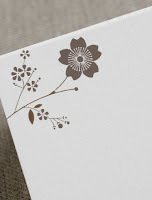 Like for example, the wedding invitations, you have to plan carefully the design so it will go perfectly with the motif. Cherry blossom wedding invitations are just some of the most beautifully designed invites I have seen. For me, it really depicts a symbol of happiness and long life for the couples getting married. This design that you see in the picture is one of my favorites. Check on the link for the loads of different designs and colors that will surely make your wedding day the most cherished moment of your life.